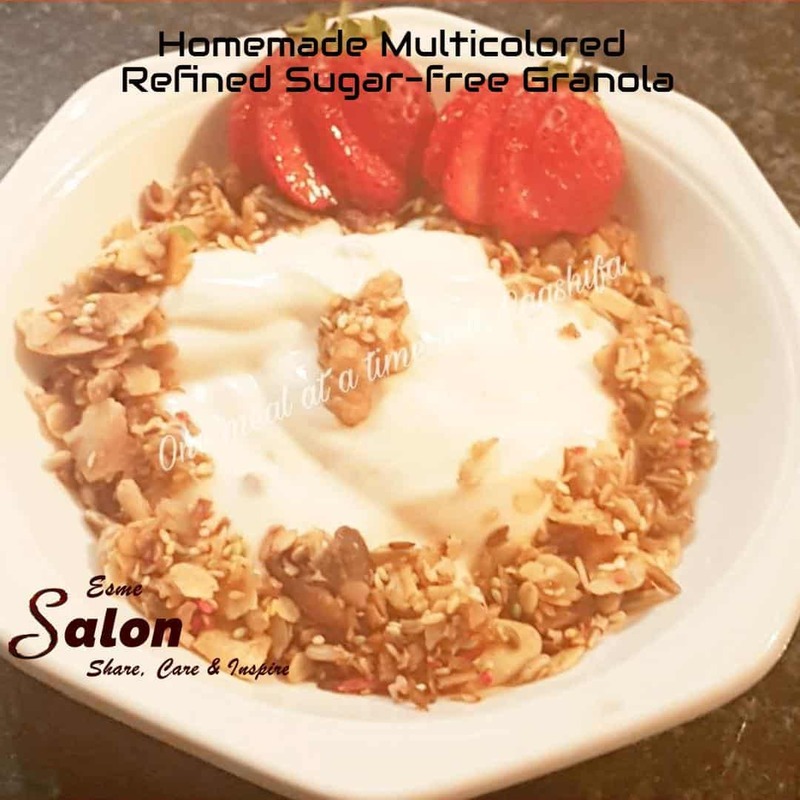 My Homemade Multicolored Refined Sugar-free Granola, is not only a wonderful breakfast option but can also be eaten as a snack or a treat when u really need a guilt-free indulgence. The granola is gluten-free (choose oats wisely) wheat-free, and refined sugar-free making it suitable for diabetics and catering for those with multiple food allergies too. Combine the nuts and seeds in a bowl. Add half of the oats and half of the shredded coconut. Keep the other half aside. Mix in the coconut flour, xylitol, salt, and spices. Stir in the 1/4 cup melted coconut oil. The mixture should be clumpy. If it’s too dry, add more oil. Line a baking tray with baking paper, add the mixture and bake at 160C until lightly toasted. Remove from the oven and toss in the rest of the oats and coconut flakes and bake until brown. Remove and drizzle with honey. Toss the mixture lightly and leave to cool. To prevent the mixture from going most and soft add a desiccator packet or add a dry tea bag instead. We do have more Granola recipes.